Springtime is long gone, even though it only seems like a couple of months ago that we were coming out of winter. Suddenly, here we are, getting ready to enter the fall season, and true to form, during the past several weeks I have been seeing trees go into what TJ (Certified Arborist here at RTE) calls “late season blues”. During this time we start to see an accumulation of issues on tree leaves that make them look less than pristine, sometimes even tattered and tired. It is almost as if the plants are tired of fending off all the plagues that they must coexist with each season, and allow their defenses to drop before they go dormant. 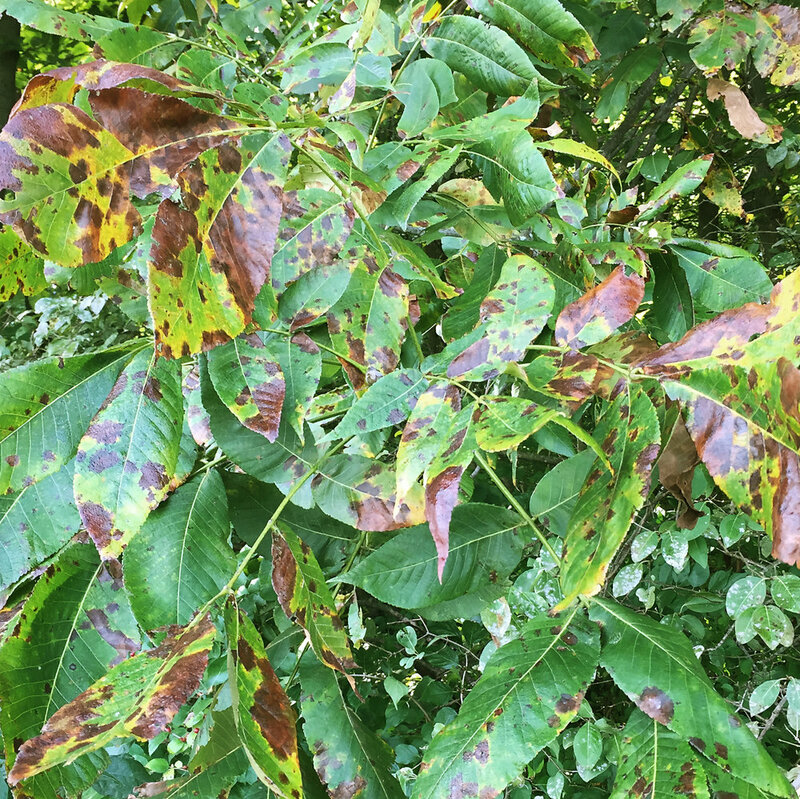 I knew we were into the late season blues when I started to see certain types of flowering cherry exhibiting quite spectacular outbreaks of leaf spot, and clients began to call very concerned about the discolored leaves falling off their trees rather suddenly. This was around mid-August, and I continued to see it several weeks after. During the heat of late summer I commonly see the lacy, cutleaf varieties of various species begin to scorch around the leaf margins. Same for some variegated species like tricolor beech, when planted in full sun. 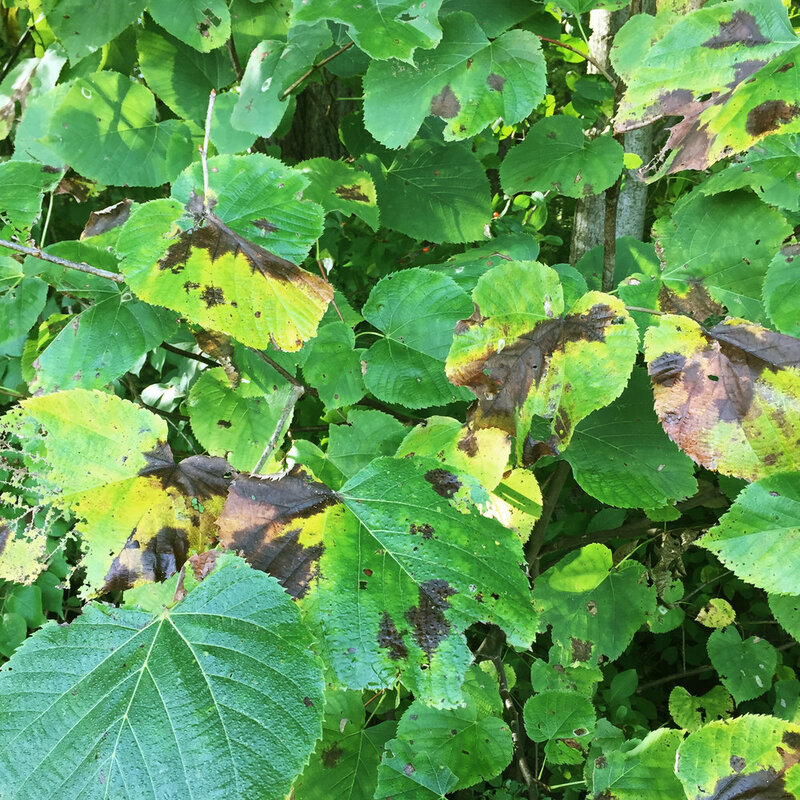 River Birch and Cottonwood, among others, can go through a period of early defoliation during dry summer heat, causing clients to think that their trees are dying. Multiple late season foliar issues, which I typically lump under “late season foliar diseases” start cropping up. Why do I sound so nonchalant about these things? Well, in a nutshell, it has to do with the time of year. If these symptoms only become evident in late summer/early fall, there is usually nothing to worry about concerning long term tree health. Biologically, by late summer/early fall trees have largely made and stored enough sugars and starches to supply their needs for growth and reproduction the following season. Aesthetically, we are beginning to enter the time of year when some trees are thinking about fall color, and soon all of them will be switching to the seasonal color scheme. The loss of some green here and there is not as tragic as it would be earlier in the season when we need our trees to show up in their best threads. In my part of town (Northwest Columbus), late season blues this year have shown up as a higher incidence of foliar fungal diseases, such as late season anthracnose (something I usually see in early spring). Why? Fungi that infect tree leaves prefer cool, moist weather, and this season we have certainly had a lot of that! Everywhere I go, clients tell me the same thing: “I have barely had to water my lawn this summer!” For the same reason, I have noticed many more mushrooms than usual this year, and of several types I have not seen before. During late summer/early fall, issues affecting the leaves/canopy of trees are generally not as bad as they look, and chances are very good the tree will leaf out normally next spring. For this reason I may ask a client to send some photos of what they are seeing. This helps me return a quicker answer during this busy time of year. In the meantime, if your tree looks like it has some sort of fungal issue in the leaves, a good fall raking will help remove the source of inoculant for the following season. Following are some photos I took yesterday. I am sharing these because as bad as these leaves look, I was not concerned for the health of these trees at this time. Enjoy the photos. Better yet, get out on one of our plant walks, or on your own plant walk, and enjoy this season! I am looking forward to a colorful fall this year, especially if moisture levels continue the way they have been. Thank you for reading, thank you for your interest, thank you for your love of trees. Hackberry. Foliar fungus (possibly) with some insect feeding damage.